I often get folks asking me if my activism hurts my grades. After all, I am one of the most vocal pro-campus carry students at Ohio State University and director of Ohio Students for Concealed Carry. Ohio State is also an extremely liberal environment. There was the time campus police detained me during Students for Concealed Carry’s empty holster protest. A liberal blogger launched an attack on me and a professor campaigned for my expulsion. I persevered and paid them no attention. They eventually went away and I was named to Campus Reform’s list of conservative activist heroes, as well as to TownHall Magazine’s TownHall of Fame. All the while, my major GPA did not suffer. In fact, it stands at 3.405, which is higher than it was that fateful April evening. I attribute that to the fact that I am an engineering student. Engineers, mathematicians, and scientists live in the world of quantifiable data. The one time an instructor (a graduate teaching assistant, actually) put up a slight objection, I offered statistics and he quickly agreed campus carry is a good idea. 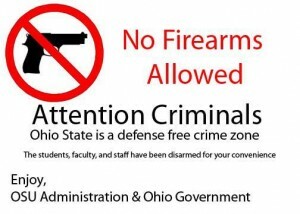 I asked my dynamics instructor, a tall, boisterous German, to sponsor Buckeyes for Concealed Carry. He didn’t even allow me to finish before he told me how he got news of the tragic Virginia Tech shooting. That’s why it’s no surprise to me that a recent University of Texas/Texas Tribune Poll found that the majority of Texas voters who have attended college favor campus concealed carry more than their neighbors who haven’t. they easily understand that armed resistance is a great deterrent. When you tell them that in 2012, 741 (0.229%) of Ohio concealed handgun licenses were revoked for reasons including criminal convictions, mental adjudications, death, moving out of state, and voluntary surrender, they correctly surmise that licensees are law-abiding citizens. When you tell them that a licensee faces a felony for consuming alcohol while carrying a concealed handgun, they recognize that the people who go through the trouble to obtain a concealed handgun license won’t consume. If they don’t, you can just point out that in Ohio, licensees have been carrying into bars for nearly two years and there hasn’t been one person injured as a result. Even for the hardest to convince, you can point to Woodfest and Chitshow, block parties attracting thousands of partying students and other young people. One year, the parties were so large that riot police deployed pepper spray to break them up. Every now and then you run into folks who think campus carry is an awful idea because college student licensees are somehow less responsible than licensees who don’t attend college. Facts just don’t support that claim. The fact is that there are 220 campuses in Michigan, Colorado, Utah, Oregon, Virginia, and Mississippi where campus concealed carry is permitted. The fact is that these institutions have a combined student population of ½ million and total population of ¾ of a million after adding faculty and staff. The fact is that none of those institutions have experienced a single incident of gun violence (including threats and suicides), a single incident of gun negligence injuring innocent people, or a single gun theft as a result of licensed concealed carry. If you run into someone, who after being exposed to those facts, still thinks campus carry will result in blood in the streets, then he or she is probably a student of indoctrination with no exposure to reality. Thankfully, he or she is in the minority.